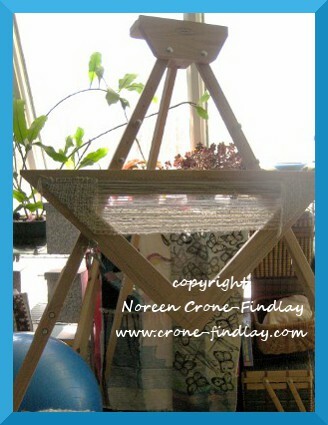 At the beginning of May, a ‘new-to-me’ loom , a large Mirrix tapestry loom, arrived in my studio. (Courtesy of my son and daughter in law who picked her up in the city 4 hours away, that used to be her home- the previous owner didn’t want to ship her). I immediately sat down and made a whole lot of heddles for her, as she didn’t come with them. And then, I warped her up- ooooooooohhhhhhhhhh, I love how easily she warps! Bliss! I looked, and sure enough! There is a Mirrix group…. which I joined, pronto. 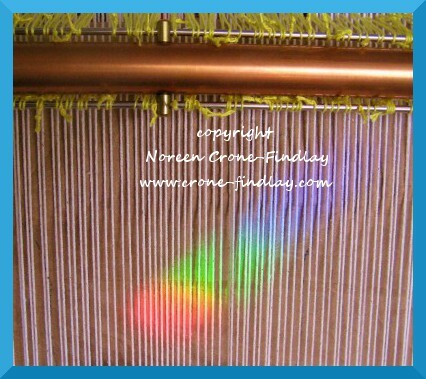 Well… I had decided within hours of starting to weave on my ‘Joni’ loom that I wanted to fill my studio with Mirrix looms. So, I sent off an application…. Um… I wanted to fill the studio with ~Smaller~ Mirrix looms! MEANWHILE>>>> The Joni is one big Mamma, and even though I am tall, my arms are short, so I found that I was having shoulder pain. My clever daughter in law subtly sneaked the information out of me that I was longing for the treadle kit for the Mirrix loom. Then, she orchestrated the family buying me the treadle kit for Mother’s Day! What a sweetheart! To say that I was thrilled was an understatement! THEN! on the 18th of May, was just tickled pink to hear from Elena that they had picked me as one of their team for the 4 months of the ‘Social Networking’ campaign. Whee! What a couple of thrilling days! And, now… I am starting to keep my part of the bargain, which is to chronicle my experiences with the Mirrix loom(s). 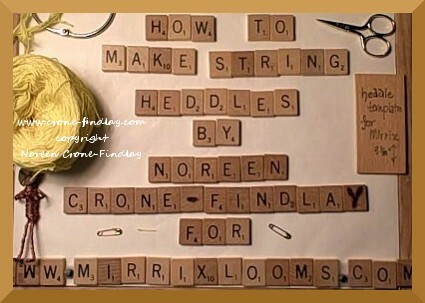 So, since I began my Mirrix adventures with making string heddles, I am going to show you my quick and easy way of making the string heddles for the Mirrix looms (or inkle or frame looms, too). 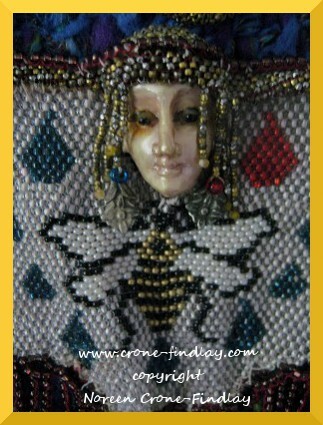 I love beads- how could I NOT love beads? The colors! the textures! the complete wonderfulness of them- sigh…. 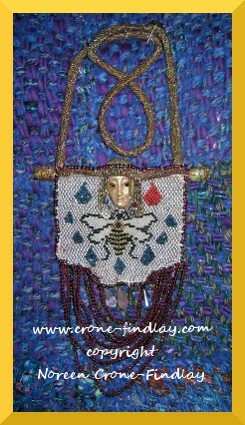 This necklace is an homage to the Minoan Goddess of the Bees. The blue teardrop shapes are dew drops, as the Minoan Goddess of the Bees is also known as ‘The Dewdrop Goddess’. I love that—- dew happens when the earth is waking up and shifting from the dreamtime to the waking world. How wonderful that there is a tiny Goddess there, guiding us back from our dreams, to our waking lives, and refreshing our spirits with dewdrops! The red petal is a pomegranate seed, as The Minoan Goddess of the Bees is also closely aligned with the Goddess, Persephone. Persephone was snatched from this world, and taken to the underworld, where she ate 3 pomegranate seeds. This meant that she had to return to the depths for 6 months of every year. In Western Canada, where we live, winter reigns for at least 6 months of the year, often longer, so I resonate deeply with Persephone’s journey! By the way, I love how the corded part of the necklace formed a figure ‘8’ – tilt it sideways, and you have infinity! I carved her face from a tagua nut (an ecologically harvested palm nut) that is also known as vegetable ivory. I have never done much loom beading, but that is about to change! Every year, Claudia and Elena at Mirrix looms have a ‘social media campaign’. They choose 2 weavers (a bead weaver and a tapestry weaver) to be part of the team, and then give them each a Mirrix loom. 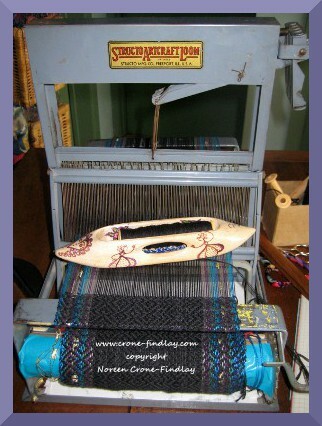 Then, the weavers blog and post and tweet and fb etc about their adventures with their Mirrix looms for 4 months. Well… I am soooooooooooooo delighted! They picked me as one of their weavers! wheeeeeeeeeeeeeeeee! ‘Hmmmmm… there must be a Ravelry group for Mirrix looms’. I joined, and the first thing I saw was that they were having their annual Social Media networking campaign. I sent in my application, and last night, I was doing a huge happy dance to discover that I got picked for the team! Speaking of bead weaving, I treated myself to Claudia’s bracelet workshop on Craftsy (anyone who has seen any of my video tutorials will know that I am madly in love with bracelets!) and I am chomping at the bit to get going on a bunch of yummy woven bracelets! Alright…. 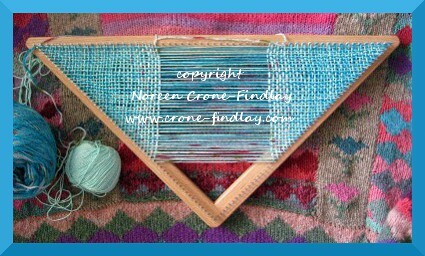 back to work on design deadlines so I get back to my weaving! Last week, a friend asked me what I was working on these days. In response, I rattled off a list of projects and tasks that is the length of my arm. Anyhow, here are some of the things that are happening in my studio right now…. We have adopted an adorable little rescue…. he’s 4 1/2 years old and is just wonderful. (except for being a cat botherer… that is NOT good 😦 ) This is him (in his fetching blue harness) with his adopted big brother. (Our dear old chihuahua/daschund cross). Ah, well, other than being oh so barkie about the cats, he is completely adorable. As you can see, he has settled in beautifully. Although, every adoption takes time and patience and attention…. Okay, in the southeast corner, there’s a big project happening on my tri loom (configured to the 3 foot size). 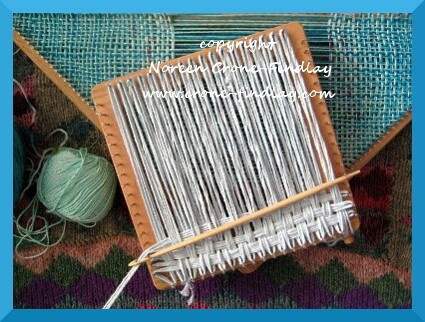 My tri loom is from Dewberry Ridge looms, and it’s beautifully crafted. I love it. I am delighted with my ‘new to me’ Mirrix ‘Joni’ tapestry loom. I am just singing Joni’s praises! I am loving working with her! Perfection! At the same time that I bought Joni Mirrix, I spotted a little wooden tapestry loom on Kijiji, and happily bought her. 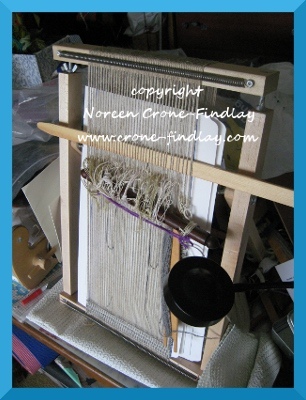 This is a very slow little loom to work with, as there are no built in shedding devices, just good old fashioned weaving swords and string heddles. And………… I am also working on a whole buncha other stuff, that I’ll be telling you more about later. Until then, may the sun shine softly upon you!